In the hierarchy of difficulty in terms of predicting the outcomes of certain markets, you would be hard-pressed to figure out a harder segment to forecast than currencies. There are trillions of dollars traded every day, the markets are open 24/7 and the variables that impact these movements are nearly endless. The outcomes of market movements based on currency movements, however, are a little clearer. This piece I wrote for Bloomberg looks at the relationship between the markets and the dollar to show how those relationships have looke dover time. History suggests that if Kudlow is able to follow through with his policies to create a stronger dollar, this trade will likely work out for investors. From 1974 through the end of 2017, a Federal Reserve index tracking the dollar has increased in 25 calendar years and fallen in 19 of those annual periods. The average annualized returns for gold when the dollar was up in a given year was minus 1.7 percent. In the years when the dollar index finished down, gold was up an annualized 16.4 percent. So gold does much worse in a rising dollar environment. In fact, the correlation of the prices of gold and the dollar is minus 0.6 since 1974, signaling a strong inverse relationship between the two. A strong dollar would also likely benefit U.S. stocks but hurt foreign shares held by U.S. investors. Those who own international stocks are subject to currency fluctuations. You’re subject to the fluctuations of the local currency in which you invest when it gets converted into dollars, unless you’re invested in a currency-hedged fund. When the dollar is strong it can hurt your international holdings and when the dollar is weak it can help them. You can see a pattern when comparing foreign and U.S. stocks to the dollar’s performance. Stocks outside of the U.S. outperformed in the 1980s and the 2000s when the dollar index fell; they underperformed the U.S. when the dollar rose in the 1990s and so far in this decade. A rising or falling dollar in any given year doesn’t appear to have much of an impact on U.S. stocks. Since 1974, the S&P 500 had an average annual return of 11.6 percent in years when the dollar rose. And when the dollar fell the S&P was up 10.4 percent per year, a small difference. But foreign stocks have seen a huge divergence between up and down annual periods in the dollar. When the dollar rose, the MSCI EAFE was up just 4.7 percent annually while down years in the dollar saw foreign stocks gain 16.7 percent a year. It’s estimated that almost 45 percent of sales for large-cap corporations come from overseas as many U.S. companies are multinational. So it’s possible that the relationship between U.S. stock market performance and the dollar may not be as clear cut in the future but currency fluctuations will certainly continue to play a role when investors hold assets outside of their home country. 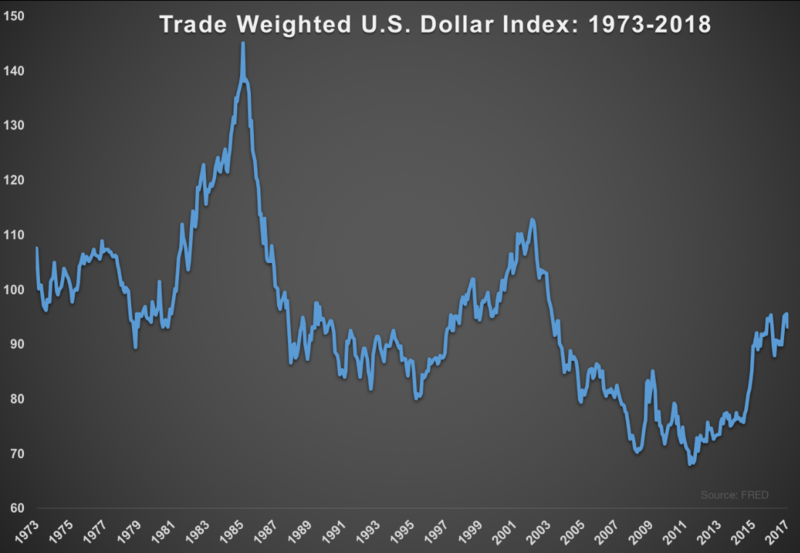 While the dollar has basically gone nowhere from start to finish over this 45-year-plus period, it has been highly volatile. In fact, the volatility of the dollar index is more than 7 percent, which is roughly half that of the stock market. For a data series that doesn’t go up and to the right over time like the stock market, currencies can see wild fluctuations. The historical investment relationships in a strong dollar regime are pretty clear — gold and foreign stocks tend to underperform. The problem is that it’s not always easy to predict the direction or magnitude of the move in the dollar. Currencies are affected by a large number of variables and don’t always do what politicians or economists would like them to.